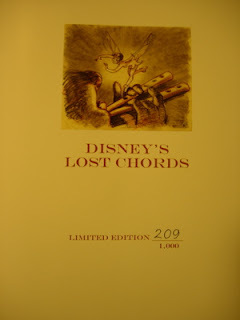 This is the book, "Disney's Lost Chords" by Russell Schroeder. This book was a limited edition of 1,000 copies. 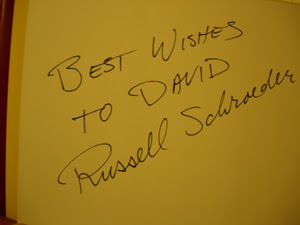 As you can see, I got a personalized autograph from Mr. Schroeder. 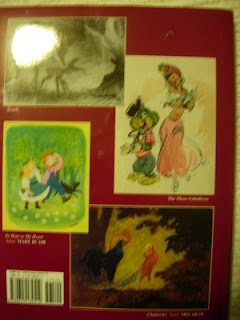 This book is a compiliation of sheet music of Disney songs and music that was never used in the Disney films that they were created for. 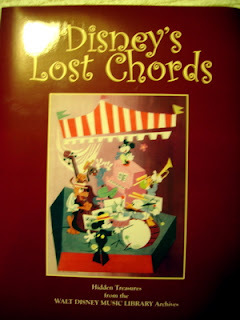 This book is a must-have for hard-core fans of Disney music, and especially for those of you Disney fans who know how to read sheet music and play the piano! Another amazing thing about this book is the artwork found throughout the book. It is simply amazing! I attended the National Fantasy Fan Club's convention last year, where this book was being discussed. I was one of many fortunate people who got to witness some of the songs in this book actually be "performed" live, with 3 singers and a piano player, and with the songs being introduced by Russell Shroeder himself. It was an amazing and powerful presentation at the convention, one that all in attendance will remember for a long time. This is a beautiful book, and I am blessed to have received a copy. Hopefully they will expand the printing of this book so that more people can enjoy it.